In economics, trust is often associated with the risk each consumer assigns to the compensation they receive in a transaction. Assessing this risk is essential and depends on the data available to consumers. Labels, in their capacity as markers of trust, should therefore reduce the information asymmetry between buyers and sellers. In law, trust is usually defined as believing in one’s good faith. 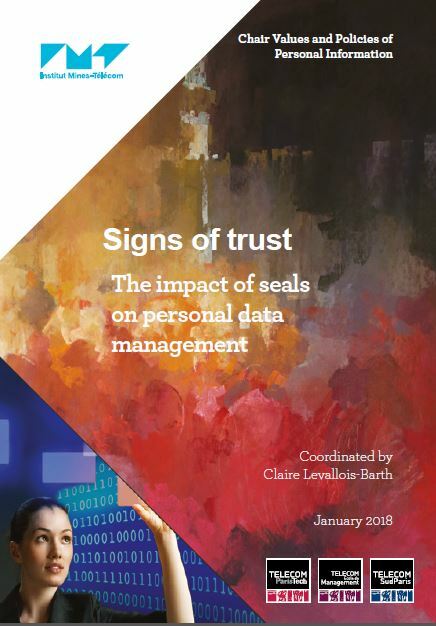 Trust is first used to protect vulnerable parties, most importantly the person whose data is being collected. However, digital transformation has re-oriented the legal approach to ensuring the effective operation of markets by adding third parties to provide trust, for instance to deal with digital death or medical data. It is therefore necessary to update our understanding of how law implements the question of trust. No longer defined solely by constraining provisions ("hard" law), legal mechanisms now also aim at nudging the behaviour of both consumers and producers of digital goods and services ("soft" law). In this context, labels, as outward and visible markers of trust, are central as they are able to orient these behaviours. Finally, from a socio-philosophical perspective, trust acts as one of the main uncertainty-reducing mechanisms in our increasingly complex modern society. To reduce complexity, a conceptual distinction is made between declared trust and assured trust (or confidence). How can labels be designed as mechanisms towards trust? Labels undoubtedly provide economic benefits both for consumers and companies. Clients need to be reassured on the efficiency of digital services before they engage in a trusted economic exchange. No business model for online trust has emerged however, because of contradictory incentives. For instance, when pricing the delivery of a label, that label should be expensive enough that it sends a clear message of commitment to potential clients, but not too expensive that companies would have no interest in participating. Labels need to be considered as a support mechanism for companies to gradually increase their level of data protection; but the concrete details of such mechanism still need to be elaborated on. State intervention is necessary on at least three issues: establishing a reference framework, certifying companies that deliver labels and imposing deterrent sanctions in order to stabilise the market. Necessary as it might be, State intervention, if too strict or too costly, can push economic actors towards private labels, which can have a misleading effect as they offer an idealized picture of the actual levels of data protection. We consider this risk to be very tangible today, as the methods of label creation and delivery are under regulated. Lastly, this report frames the issue of labels within a larger perspective, including three main questions. First, what is and what should be the State’s role? Once solely managed by the legislative branch, labels are now handled to varying extents by the State, markets and consumers - as the rise of soft legal mechanisms shows. This evolution can be interpreted as either States giving up on their ability to regulate certain aspects of digital technologies, especially globally, or entering a constructive dialogue with non-State entities such as labelling and consumer organisations and professional associations. Second, the current state of trust has an impact on individuals. On the one hand, labels provide consumers with information, but on the other hand, it is difficult for consumers to exercise their free will: is there a risk that labels become so omnipresent they disempower users by releasing them from critical analysis? Finally, this book explores the relation between trust and design. Approaches such as “privacy by design“ and more recently “data protection by design” are becoming part of common speech. Over-using such notions could however make them meaningless. We therefore searched what “trust by design” could mean, along with the limits and contradictions that such a notion could bear. Is the major risk not that of trying to formalise and nudge trust-based relationships, especially through the use and creation of labels? Chapter 11. Is blockchain a trustworthy technology?